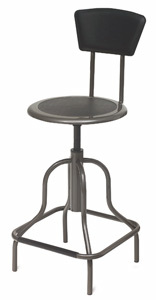 These stools are a great value for institutional and educational use. Each features a steel frame that is built to stand up to heavy use. A nylon coated screw lift manually adjusts the padded vinyl seat. The 14" diameter seat rotates 360 degrees. Suitable for working at a high workbench or table. Available with or without a backrest. Its bell-shaped, four-point base contains a built-in ergonomic footrest, and measures 21" × 21". Adjust the height of the stool from 22" to 29". Clear coat pewter finish. ® Workspace is a registered trademark.